RecurDyn, provided by FunctionBay, is an interdisciplinary, computer-aided engineering (CAE) software package whose primary function is the simulation of multibody dynamics (MBD). 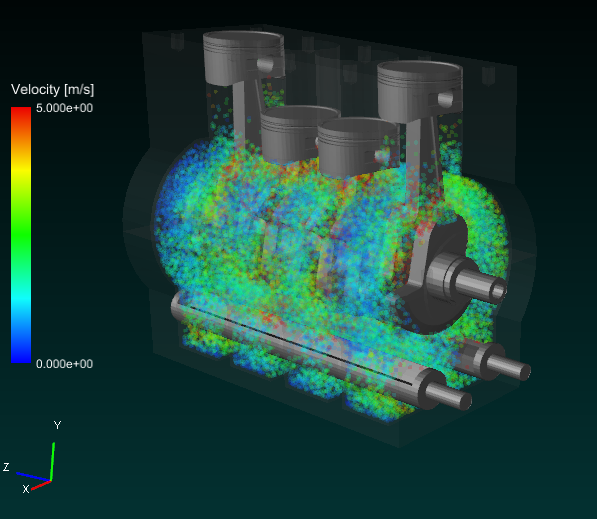 Particleworks, provided by Prometech, is a leading software for simulating the movement of fluids including large free surface deformation which is considered to be very difficult to simulate. Users can run a co-simualtion between Particleworks and RecurDyn on the Rescale ScaleX platform by following the steps outlined in the tutorial below. This tutorial will demonstrate running a co-simulation of RecurDyn and Particleworks in batch. The simulation used in this demonstration is to check the effect of piston behavior on the lubricant distribution in the engine. Approximately 50,000 particles were used. You can click on the Import job Setup button to clone this tutorial&apos;s job setup or on the Get Job Results to share this tutorial&apos;s completed job to your account. To perform the co-simulation between RecurDyn and Particleworks on Rescale, you need to create a project suitable for command use. This process should be preceded with a model on Windows environment to allow you to analyze it using the Linux environment within Rescale. To create sampleEngineModel.rmd, open sampleEngineModel.rdyn in the ‘scene’ folder and create .rmd file. 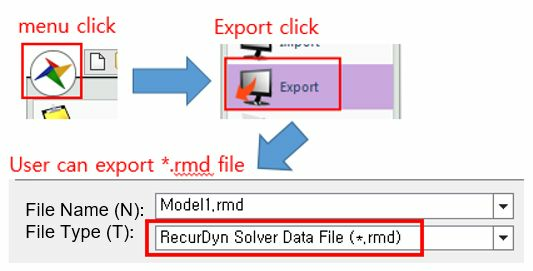 Save the setting parameter of RecurDyn solver and export it from the RecurDyn model. To create sampleEngineModel.rss - On the Analysis tab, click the Scenario and follow the process showin in the figure below to create an .rss file. The .rss file is a Simulation Scenario file, which contains information of the time required for simulation and data output interval. Both sampleEngineModel.rmd and sampleEngineModel.rss should be located in the scene folder. Please refer the RecurDyn online help > Linux Standalone Solver for more information. Suspend Particleworks after it solely analyzes 1 step. Then project file/scene/sub.json is automatically created. The sub.json file contains variables for Particleworks. Open the automatically generated project file/models/models.json. Then leave the file name as shown in the figure below after deleting the path of the cad file. To start using Rescale, go to platform.rescale.com and log in using your account information. After logging in, you can see the initial screen as below, and manage the jobs you already have or create a new job. From the main screen of the platform, click on the +New Job button at the top left corner of your screen. This will take you to a Setup page. Zip the folder you created in the previous section To Generate a Project File locally and then upload the project file (*.zip) on Rescale. Click Next to move on to the Software Settings section of the analysis. After clicking the ‘Software’, search for ‘Particleworks’. Then, add it to the software configuration settings. Note: For the co-simulation using commands, the commands for Particleworks control all commands including RecurDyn. This is essential for the correct use of the hardware and parallelization libraries required in the parallelization settings of Particleworks. Enter the path to the license that you have in the Licensing Options to connect the license server with the Rescale. Search for RecurDyn and add it to the software setting. Comment out using # in Command window of Analysis Options (Ex: #rdsolver). Enter the path to the license that you have in the License Options to connect the license server with Rescale. export OMP_NUM_THREADS=18: Defines the number of hardware threads used for variables of OMP_NUM_THREAD. For example, when using Intel Xeon E5-2655 v3 hardware for simulation, this hardware has 9 cores, and rescale uses hyperthreading by default, therefore the number of threads is 18.
export MPI_PROCS=$((RESCALE_CORES_PER_SLOT / (OMP_NUM_THREADS/2))): Since parallelization of Particleworks is done by process unit (1 process means 1 node), the total number of processes should be entered in the command. The total number of cores can be loaded by using ‘RESCALE_CORES_PER_SLOT‘, Rescale&apos;s own variable. This can be divided by the number of cores per node (OMP_NUM_THREADS / 2) to calculate the number of processes to be created. -p $PWD/scene: working directory. For this demo, the operation is performed in the ‘scene’ folder, a subfolder of $PWD, which is the decompressed current location. Click the Hardware Settings button to select the appropriate hardware provided by Rescale. For this exmaple , 18 cores on Onyx type is chosen. Click the Submit located on the upper right corner of the screen. Then, the simulation will proceed in the following order. Click the Process_output.log in the ‘Live Tailing’ window. You can see the simulation log output in real time and the status message of the solver. All the output logs are the same as in a general Linux environment and can be used for the review in the same way. Click the Results tab on the right. Click the Download Job to download the result files. 본 데모에서 사용할 예제는, 리커다인과 파티클웍스의 연성 해석을 통해 엔진 내 피스톤 거동이 윤활유 분포에 미치는 영향을 확인하기 위한 시뮬레이션이며 약 5만개의 입자를 사용하였다. 다음 링크를 클릭하면 작업 설정을 가져 오거나 Rescale의 플랫폼에서 직접 작업 결과를 가져올 수 있습니다. 리스케일 환경에서 리커다인-파티클웍스 연성해석을 수행하기 위해 먼저 커맨드 사용에 적합한 프로젝트를 생성하여야 한다. 윈도우 환경의 모델에서 본 작업이 선행 되어야 리눅스 환경을 기반으로 하는 리스케일 플랫폼에서 해석이 가능하다. 역시 자동으로 생성된 프로젝트/models/models.json 파일을 열어, 아래 그림과 같이 cad파일의 경로를 삭제하고 파일명만 남긴다. 새로운 작업 생성 - 새 작업 버튼을 클릭하여 새로운 작업을 생성한다. 소프트웨어 선택 탭에서 ‘Particleworks’를 검색하여 추가한다. 참고: 커맨드를 이용한 co-simulation의 경우 Particleworks 커맨드를 사용하여 리커다인을 포함한 모든 명령을 제어한다. 이는 Particleworks의 병렬화 셋팅에서 요구하는 하드웨어 및 병렬화 라이브러리를 정확히 사용하기 위해 필수적이다. ‘분석 옵션’의 ‘Command’ 창에 co-simulation을 위한 커맨드를 입력한다. ‘라이선스 옵션’에 보유한 라이선스의 경로를 입력하여 라이센스 서버와 리스케일을 연결한다. C-i 의 과정을 되풀이하여 RecurDyn을 소프트웨어에 추가한다. export OMP_NUM_\THREADS=18: OMP_NUM_THREAD 변수에 사용할 하드웨어의 스레드 수를 저장한다. 예를 들어 해석에 Intel Xeon E5-2655 v3 하드웨어를 이용하는 경우, 이 하드웨어는 9개의 core를 가지고 있고, rescale은 기본적으로 하이퍼스레딩을 사용하기 때문에 thread의 수는 18이 된다. Export: 변수를 저장한다 export MPI_PROCS=$((RESCALE_CORES_PER_SLOT / (OMP_NUM_THREADS/2))) : 파티클웍스의 병렬화는 프로세스단위(1개의 프로세스는 1개의 노드를 의미)로 이루어지기 때문에 총 프로세스 개수를 커맨드에 입력해야 한다. 리스케일의 자체변수인 RESCALE_CORES_PER_SLOT을 이용하여 총 core수를 불러올 수 있으며, 이를 각 노드당 코어 개수인 OMP_NUM_THREADS/2로 나누어 생성할 프로세스의 개수를 산정할 수 있다. 하드웨어 설정 버튼을 클릭하여 리스케일에서 제공하는 하드웨어 중 적합한 장치를 선택할 수 있다. 우측 상당에 위치한 ‘제출’을 클릭하면 아래와 같은 순서로 시뮬레이션이 진행된다. ‘라이브 추적’ 창의 Process_output.log를 클릭한다. 실시간으로 출력되는 시뮬레이션 로그를 확인할 수 있으며, 이를 통하여 솔버의 상태 메시지 또한 확인할 수 있다. 출력되는 모든 로그는 일반적인 리눅스 환경과 동일하며 같은 방식으로 검토에 사용할 수 있다. 우측의 ‘결과’ 탭을 클릭한다. ‘Download job’을 클릭하여 전체 결과 파일을 다운받을 수 있다.